Dallas quarterback Tony Romo watches one of his tee shots take flight in the Cox Celebrity Championship at Morgan Run Resort and Club. Dallas Cowboys quarterback Tony Romo has guided his share of fourth-quarter comebacks, so he’s confident of winning late in the contest as long as there’s still time left on the clock. Or, in the case of golf, with holes still remaining to be played. Tony Romo hoists the 2011 trophy after winning the Cox Celebrity Championship. With three holes left in Sunday’s final round of the Cox Celebrity Championship at Morgan Run Resort and Club, Romo knew he had a chance. And he made the most of it at the par-5 16th hole with a 15-foot eagle putt. That made the difference in a two-shot victory for Romo (70-67—137) over former NHL player Dan Quinn (72-67—139). First-round leader Mark Mulder (67-74—141) slipped to third place. NFL Hall of Fame running back Marshall Faulk (70-72—142) was fourth, followed by former major leaguers Rick Rhoden (71-72—143) and Vince Coleman (69-74—143). Romo couldn’t help ribbing New Orleans Saints quarterback Drew Brees, the tournament host, when he was presented with the winner’s trophy. “It’s funny,” said Romo. “The only thing sweeter than this is when we went down to New Orleans and handed the Saints their first loss a couple of years ago. Brees accepted the jab good-naturedly, especially after Romo turned around and donated his $25,000 winner’s check to the Brees Dream Foundation. That increased the total donated to the foundation this week to $135,000. Romo, who started the round three shots off the lead of Mulder, strung together several pars on the front nine to stay in contention. Four one-putts with his belly putter after the turn moved Romo up the leaderboard before the eagle landed him in the lead. 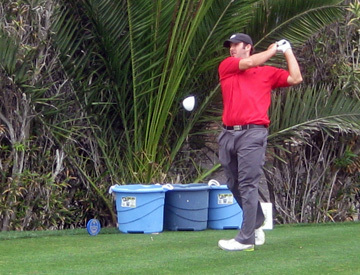 Romo, who annually attempts to qualify for the U.S. Open, has won his share of these celebrity golf events. That said, the Cowboys quarterback will have no trouble keeping himself occupied over the summer if the NFL lockout drags on.